[Gaithersburg, Md.—July 19, 2018]—Electro-Media Design (EMD) President Jeff Loether was “all ears” at HITEC Houston last month as he listened to hoteliers’ tales of woe when self-managing their hotel’s audiovisual operations. Conversations with multi-property owners and operators representing more than 30 hotels (including brands, independents and casinos) are continuing. Operators are eager to learn even more about AVaStar and how the patent-pending solution developed by EMD can help their non-technical staff better coordinate audiovisual equipment rental, set up and servicing. “HITEC Houston was a successful show for Electro-Media Design as we used this venue to launch a first-of-its-kind solution,” Loether said. “AVaStar is ideal for any hotel struggling with self-managing its AV operations. A management company, for example, probably doesn’t have an AV specialist who oversees and trains staff in the sale, use and maintenance of audiovisual equipment. Each hotel in a multi-brand portfolio scenario may have its own AV specifications; some flags may allow portable equipment while others insist on built-in solutions. It can be really challenging, especially when capturing AV revenue is so critical to the bottom line. AVaStar is a single, dedicated platform for conducting all AV Technology activities, including planning and providing audiovisual services, managing meeting needs, scheduling resources, and tracking financial performance. It ensures that equipment and services are delivered and meeting customer expectations by prompting non-technical users with interactive, step-by-step sales, setup and troubleshooting procedures. When it comes to service and maintenance, AVaStar’s ticketing system and maintenance schedule reduces downtime and ensures that everything works. Hoteliers are not the only people interested in AVaStar; some of the industry’s leading hotel technology consultants are also intrigued with the software and the efficiencies it brings to hotels. 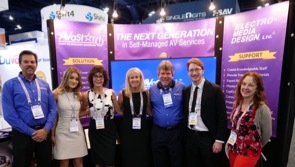 “AV support is on the front line of hotel convention services – these providers are the ‘roadies’ of the event world,” said Corbin Ball, founder and owner of Corbin Ball & Co. and hospitality’s foremost authority on all-things technology when it comes to the meetings industry. “With the hard work and long hours required, their support is crucial to a successful event. However, especially with smaller properties, in-house AV support services have been left to fend on their own in terms of managing event technology processes and coordinating equipment rental and servicing. There have been no standardized business models and no specialized education to help. “We’re thrilled that AVaStar has stirred such curiosity among hoteliers, consultants and even the media,” Loether said. “Top editors from the leading hotel press also met with us to learn about this technology to better educate hoteliers. As we expand on conversations with outsourced event-technology companies who are supplying AV equipment to hotels and the industry’s leading suppliers of sales-and-catering software – both of whom will benefit from by partnering with AVaStar – we will keep the industry apprised of the latest integrations and installations. (From Left) Eric Bracht, AVaStar; Abby Elyssa, Hotel Business; Michelle Renn, Hotel-Online; Ann Boone, Hospitality Upgrade; Jeff Loether, EMD; Elliott Mest, Hotel Management; and Anna Wolfe, Hospitality Technology. AVaStar is an event-technology platform designed to provide a comprehensive suite of services. It’s an interconnective software which provides systems and templates that cover the entire spectrum of activities associated with operating and managing technology systems and services. AVaStar extends support for professional consulting and design services through its working relationship with Electro-Media Design, the foremost consultancy in meeting, entertainment, and event technologies and acoustics. Electro-Media Design, Ltd. is an independent technology design and management consulting practice. For more information on AVaStar, visit www.avastar.io or call (442) AVASTAR. Built-In or Portable: What's Your AV Strategy?